The Best Elvis Presley Of Malaysia. The Man With The Golden Voice Of Elvis. In 1977, Elvis Presley, the King of Rock and Roll shocked the world whenhe was found dead in his bathroom. Come August 16, it will be the 30th Anniversary of his death. The man from Memphis has left behind a legacythat continues to live on, now with Malaysia's very own King of Rock and Roll following his footsteps …. Elvis Presley "lives" again in Malaysia because of HT Long's long association with the King of Rock and Roll, dating back to the early sixties. He has even met the man's legendary manager, Colonel Tom Parker, being a special guest to Memphis in 1984. Long started singing Elvis Presley songs seriously, albeit with only a badminton racquet instead of a guitar, after watching the movie, "GI Blues" with his father in the cinema in 1960 when he was only 9 years old. 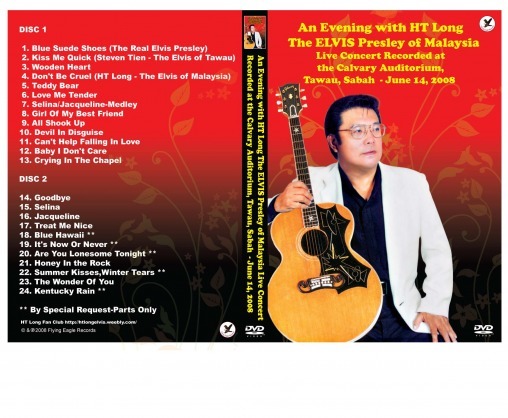 Every Sunday thereafter, he and his brothers faithfully turned up at the old Cathay Cinema in Klang, to watch the other Elvis movies, which left a deep impression on him –"Jailhouse Rock," "Love Me Tender," and "Blue Hawaii". Thirty years after the death of the original Elvis on August 16, 1977, his "Golden Voice" still sings on and never cease to win the hearts of many, young and old, who today can enjoy Long's very own "live" performances of Elvis' wide repertoire of songs. Long has also written a number of gospel songs in the tune of Elvis' rock and roll style. "Even the real Elvis had popularised a number of good gospel songs such as 'Crying in the Chapel' and 'Swing Down Sweet Chariot'," he said. In the last few years, Long has attracted raving reviews from many international television and radio stations. He has been interviewed on Radio TV Hong Kong (RTHK Radio 3 Hong Kong), Philippine Broadcasting Service, Radio Poland and even appeared on both Japanese TV and RTHK Television in Hong Kong. For a Malaysian to reach such a height of success is astounding. Paul Dowling (Worldwide Elvis, USA), has called him, "The man with the Golden Voice of Elvis." Even Walter Pacheco, the President of the Official Elvis Presley Fan Club of Canada said of HT Long: "His singing voice is so versatile that he can handle Elvis Presley songs from all three Elvis era, the 50s, 60s, and 70s with ease. And he does an excellent job of it. Not many can do that." Ray Cordeiro MBE, a well-known radio deejay in Hong Kong told his audience on air: "HT Long's singing voice is so similar to Elvis Presley, that it is so unbelievable. He is definitely the best in Asia." It's no wonder that Long's reputation for being officially the best Elvis Presley of Malaysia has carried a long way for this former businessman. Long became the founding president of the Official "Elvis Presley Fan Club of Malaysia," in 1968, the first in Malaysia to be registered and recognised by Graceland Elvis Presley Enterprise at Memphis, USA. Since then, there have been many Elvis Impersonators in Malaysia, but Long stands out not because of his Elvis look, but solely on his ability to sing and sound like the original Elvis Presley. He has made it to an international audience with his golden voice, having jetted around to a number of countries, including Indonesia, Australia, Japan, Hong Kong, Thailand, Singapore, United Kingdom, and the United States. The most recent trip saw him performing to more than a thousand people at the Acacia Hotel in Perth, Australia. He has been performing in many smaller towns in Malaysia. On a busy week, he can touch down at KLIA, and drive a 5-hour journey heading North to Penang to perform at a local church, then move on to Kuantan, and going down as far as Johor Baru, before returning to Penang to take another function. His next destination could be Kuala Lipis or one of the smaller towns in Sabah or Sarawak. "I have been doing this for the past 13 years and I have never grown weary," he said. "Thank God, He has touched my heart and now, it is for me to touch the lives of many people who have lived in the Elvis Golden Era." Sitting in a small coffee shop in Bandar Sri Damansara, where this interview was conducted, a fan waved to him. "Every where I go, I meet people whom I never knew, but I am grateful that they appreciate my kind of work. One fan even said that her mother enjoyed the songs even while recuperating in the hospital," he said. Admittedly, many of his fans are also church goers. "For the Perth concert, for example, I was invited by Full Gospel Marketplace, but I also perform in company dinners and other private functions," he said. "There is still a big pool of Elvis fans out there, and I am going to rock and roll with them." Once a self-acclaimed atheist, Long said it was Elvis death that caused him to turn to God. "In my younger days, I would sing in pubs. I had no time for God," he said. "But, when Elvis, whom I had always thought was the greatest, a demi-god of some kind, died, I was forced to ask the question, 'How can my god, Elvis Presley die?'" When he finally encountered the true God at a Reinhard Bonke gospel rally at Stadium Merdeka on a November night in 1989, Long said his life has never been the same. "He touched me. I am changed." Many of his songs like "I Let My Light Shine" and "Honey In The Rock" are composed to the tune of Elvis' repertoire of songs. With 12 albums to his credit, Long believes his songs will touch many other Christians in the country, who have grown up during the heydays of the King of Rock and Roll. Two of his albums titled, "HT Long Sings The Golden Hits of Rocky Teoh – A Charity Tribute Album" and "Light & Easy, with the Golden Voice of HT Long" are well-received even in the wider market. The more popular ones are: "The Very Best of HT Long", "Songs of Love & Inspiration", "HT Long Sings The Golden Hymns". For his gospel albums, he has among others, "From Elvis to Jesus", where he shares his own personal encounter with the two kings. The latest album, "The King Is Alive Easter Concert" was tweaked towards Easter celebration recorded "live" at a local church in Petaling Jaya. "This CD has been a blessing to many people," he claimed, "even people inthe nursing home get comforted by the singing." For the disciplinary master who used to pull Long aside for keeping his Elvis-lookalike side-burn and "curry puff" hairstyle, this young man, once nicknamed Klang High School Elvis, has made every Malaysian proud to have a local Elvis who has made a name on the international scene. Long hopes to get all Elvis fans together for a major function on August 16 to remember the late Elvis Presley. He is looking for major sponsorsfor the event. In the next three months, he hopes to build up the momentum by coming on television and radio talkshows about his memories of the King of Rock and Roll. 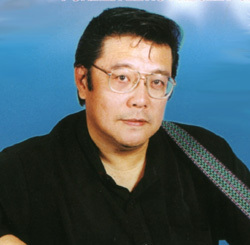 Songs from Long's albums are occasionally aired over TraxxFM. Check out the Videos in the HT's YouTube Video 2 Section..
HT Long's New DVD Concert Available Now ! !